Description: Gray or greenish above and light on the underside, usually with an overall reddish hue that range from coppery to red. 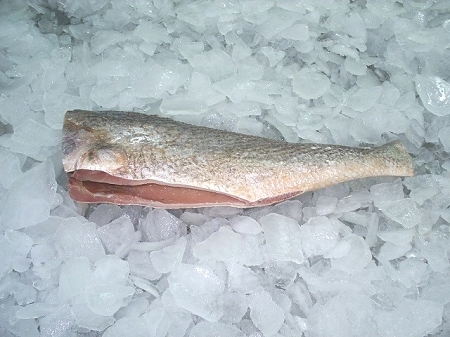 Size: Average sixe inshore is 10 to 12 inches but range from 2 to 10 pounds offshore. They can reach up to 17lbs. Mangrove Snapper Description: Mangrove Snapper have dark brown or gray with reddish or orange spots in rows along the sides and a dark horizontal band from snout through eye on young fish; two conspicuous canine teeth at front of upper jaw and the dorsal fins have dark or reddish borders with no dark spot on side underneath dorsal fin. Where Mangrove Snapper Are Found: Juveniles mangrove snapper can be found around INSHORE tidal creeks, mangroves, and grass beds while adults generally are found NEARSHORE or OFFSHORE on coral or rocky reefs. Florida Record Mangrove Snapper: 16 lbs., 8 ozs. Remarks: These snapper spawn June through August and feed on crustaceans and small fish. 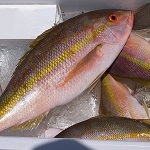 Take a look at a recent catch of mangrove snappers in the Indian River.